UPDATED: Sun., Feb. 25, 2018, 5 p.m.
(7) Pacific vs. (10) Portland, 2 p.m.
(3) BYU vs. (6) San Diego, 6 p.m.
(4) LMU vs. (5) San Francisco, 8 p.m.
(2) Saint Mary’s vs. No. 7/10, 2 p.m. 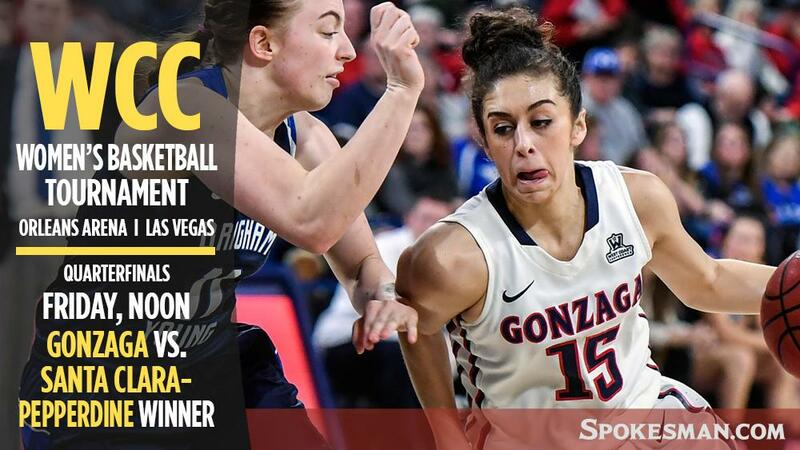 The Gonzaga women (24-5, 17-1) earned the top seed in the West Coast Conference and will open WCC Tournament play against either No. 8 Pepperdine (9-19. 5-13) or No. 9 Santa Clara (9-20, 5-13) in the quarterfinals Friday at noon at the Orleans Arena in Las Vegas. Pepperdine and Santa Clara face off in the tournament opener Thursday at noon. The Zags toppled the Waves twice in the regular season by a combined 41 points. They downed the Broncos 63-51 in December and 71-44 in January. No. 2 Saint Mary’s (20-9, 13-5) also skipped Thursday’s opening games and will start in the quarterfinals against either No. 7 Pacific (13-16, 7-11) or No. 10 Portland (7-22, 3-15) Friday at 2 p.m.
Pacific and Portland face each other in a Thursday showing at 2 p.m. No. 3 BYU (16-13, 11-7) and No. 6 San Diego (15-14, 8-10) will follow with a game at 6 p.m. No. 4 Loyola Marymount (19-10, 11-7) and No. 5 San Francisco (15-14, 10-8) will close out Thursday with a game at 8 p.m. There will be no games on Sunday. The men’s and women’s semifinals will continue on Monday, March 5. The conference winner on both the men’s and women’s side will be crowned on March 6. The women’s championship game will begin at 1 p.m. Published: Feb. 25, 2018, 4:13 p.m. Updated: Feb. 25, 2018, 5 p.m.